Salpicón de Cerdo (Pork Medley) | Mexican Appetizers and More! This Salpicón de Cerdo (Pork Medley) is all kinds of delicious and scrumptious! 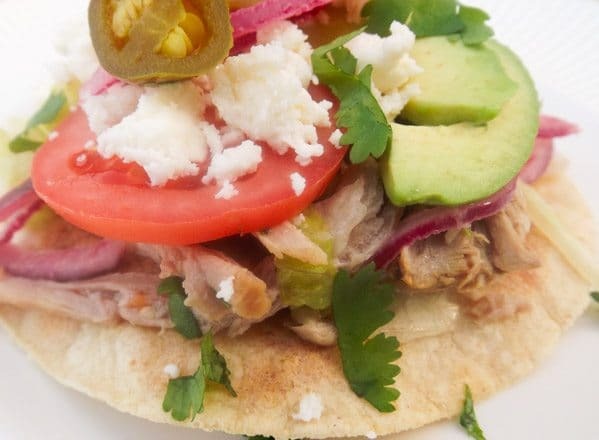 Tender pork marinated in a tasty vinaigrette, mixed with red onions, lettuce, tomatoes, cilantro, topped on crispy corn tortillas with slices of tomatoes, sliced avocado, pickled jalapeños, green chiles and queso fresco. This week I shared with you a Salpicón de Mariscos (Seafood Medley) and I promised to share a Salpcón de Cerdo (Pork Medley) with you, so here it is! 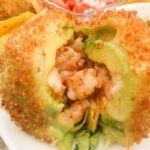 excellent appetizer served on top of corn tortillas but it is also delicious as a meal served with rice. Although this Salpicón is made with cerdo or pork, Salpicón can also be made with beef, chicken, turkey, venison, lamb and of course seafood. The history of Salpicón is still somewhat of a mystery, although, it is believed that it originated in the coastal region of Spain with mixtures of fish, fruits and vegetables. 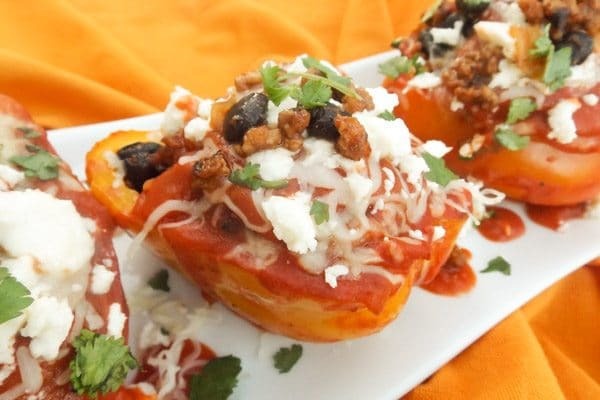 In Southern Mexico this dish is mostly eaten with meat and served cold. In Colombia, Salpicón, is a fruit cocktail drink served with orange or watermelon juice, soda and chopped fruit. In France, Salpicón, consists of diced meats, fowls, seafood, vegetables, mushrooms etc and bound with either a thick or thin sauce. Served hot or cold. 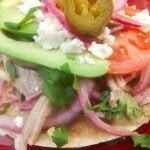 For my Salpicón de Cerdo, I mixed and embellished it with avocados, red onions, lettuce, sweet tomatoes, cilantro, lime, pickled jalapeños, green pickled chiles and yummy queso fresco. And of course, a few spices! 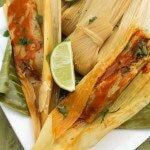 Assemble on broil corn tortillas…. 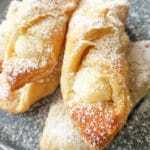 What’s also terrific about this dish, is it’s very easy to make and great for parties because it can be made ahead of time and in large quantities. So my foodie friends, here’s to Salpicón de Cerdo! Cut pork into 3 inch cubes. Add pork to a large pot with enough water to cover over medium heat. Add salt, pepper, garlic and bay leaf. Bring to a boil. Boil pork for about 20 minutes and then lower heat to a medium low. 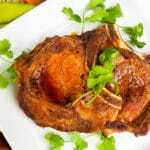 Cook for 1 hour or longer until pork is tender. Drain pork in a colander. Let cool and shred with two forks or use fingers to shred. Slice the red onion and then cut into half moons. Slice lettuce and chop. Chop 2 of the tomatoes and slice the other 3 tomatoes. Chop cilantro. Cut avocado into wedges and add juice of one lime to the wedges to prevent discoloration. In a small bowl whisk together olive oil, vinegar, juice of the other lime and if you're using juice of an orange, add now. Add salt and pepper to taste. 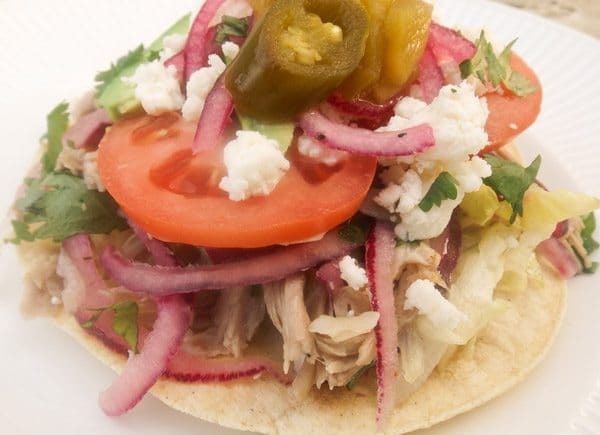 In a large bowl add pork, lettuce, chopped tomatoes, red onions and cilantro. Toss together and add vinaigrette. Let sit for a few minutes. Taste and see if additional salt or pepper is needed. Broil corn tortillas in an oven for a few minutes until they crisp up a little. 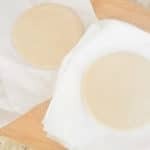 Could also fry corn tortillas in a skillet with 1- 2 tbsp of oil and crisp on each side. 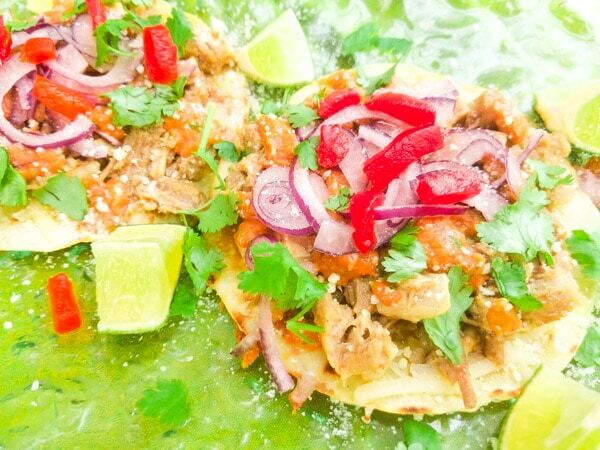 Top tortillas with pork mixture. Top with sliced tomatoes, avocados, green chiles, jalapeños and queso fresco. Enjoy! 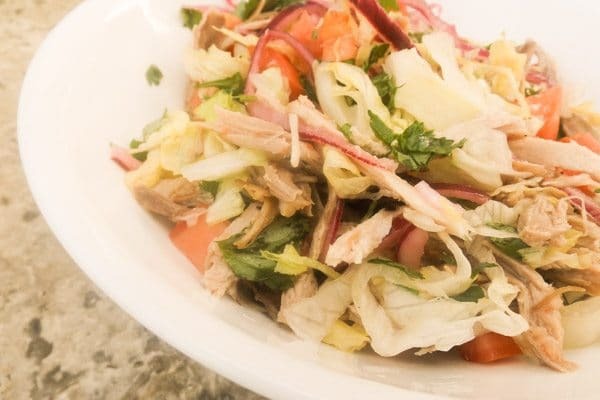 If you would like to make this recipe ahead of time, cook pork and once done, mix shredded pork with just the onion and vinaigrette then refrigerate. 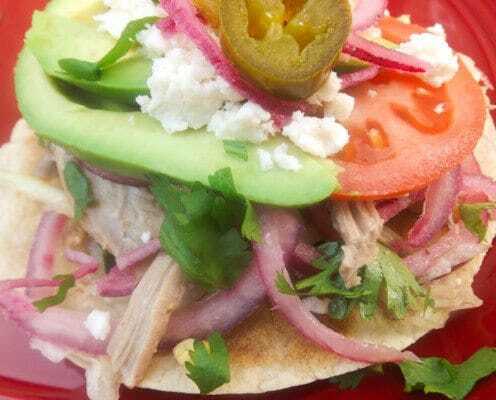 Hold off on the lettuce, cilantro and all other toppings until you are ready to have the Salpicón de Cerdo. Enjoy and don’t forget to leave me your comments, I’d love to hear from you.